Amherst Island is a beautiful place and it would be a shame to destroy this gift by allowing wind turbines to dominate the landscape. The people of your community trusted you and your fellow elected members to improve your community and now it appears you are on the verge of betraying this trust by selling out to a wind developer. Have you no regard for the negatives associated with this type of development? A wind project will divide your community and Ill bet you’ve already seen that happening – just as it has in every other community that has experienced wind development. Don’t let this green vandalism infect your community. 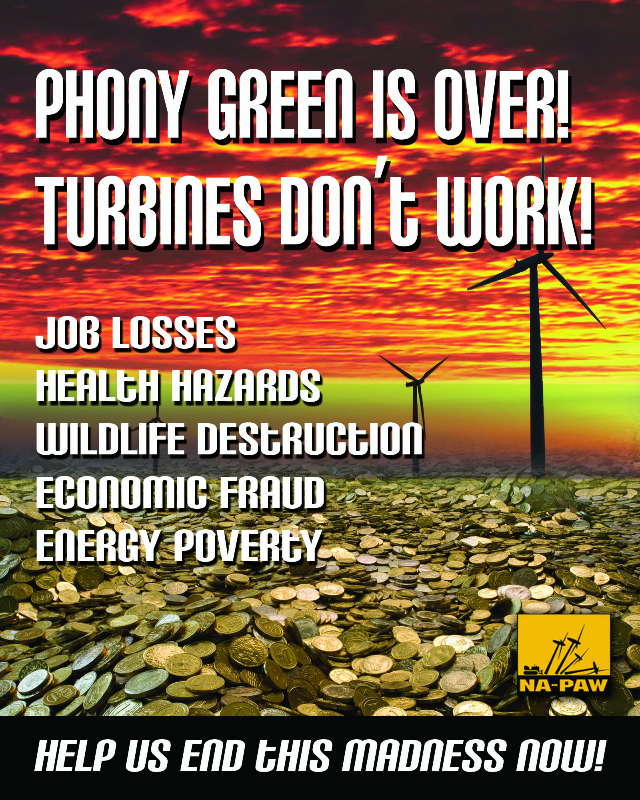 Say NO to reckless and irresponsible wind energy development before it’s too late. Windlectric’s 26-turbine project on Amherst Island will forever take from the character of the landscape. Community Vibrancy Funds, otherwise known as Community Benefit Agreements, and a host of other friendly sounding phrases, are actually proponent bribes. Negatively affect people’s healththat live nearest to the turbines – noise, stray electricity, trauma of the loss of quality of life & loss of view, light shuttering and reflecting from the blades, loss of darkness and more. Despite what you’ve been led to believe – wind is not clean energy. Cause people’s properly to become worthlessthat live closest to the turbines. 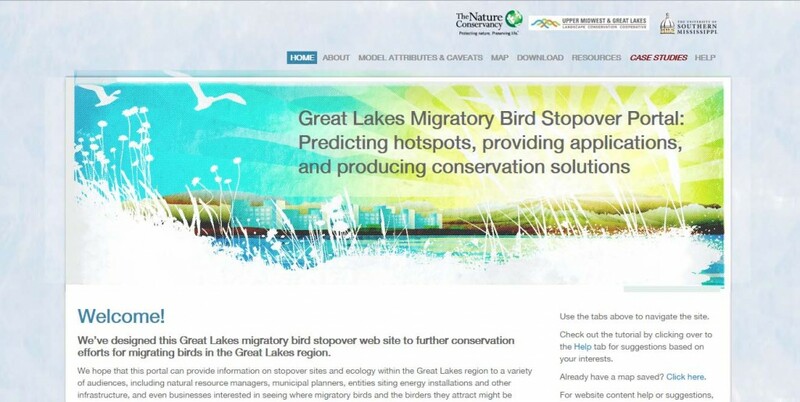 The wind developer has already lied to you and said there’s no proof that wind turbines will devalue property. Ask residents of Wolfe Island just across the NYS border in Ontario (very near Cape Vincent, NY) what’s happened to the value of their megabuck homes and the fact that assessments needed to be greatly reduced. 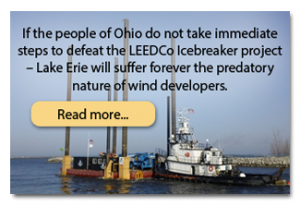 Residents of Jefferson County successfully fought the BP wind project for years and rejoiced when BP, the most notorious polluter in world history – finally gave up. The noise from the turbines is incredibly loud– particularly at night during the winter – from the incredible sleep destroying industrial loud noise, high and low infrasound, pulsating & throbbing sounds from the blades when they pass by the tower. Health, property values and noise are the biggest issues but there are many, many others as well. Decommissioning – If this project is allowed to develop on Amherst Island, your grandchildren’s children will ask decades from now – “What were they thinking?” when they view the rusting hulks of the long abandoned wind turbines because funding is not available to remove (decommission) the worthless remains. Have a look at Hawaii and what’s happened there with abandoned wind turbines and no money to remove them! 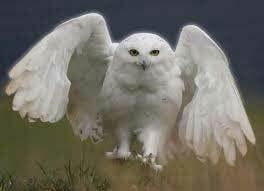 There will be a slaughter of bird and bats as there has been on Wolfe Island. 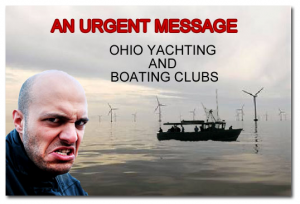 The Amherst Island Wind Project Decision should be overturned!